Purchase an Escape Travel card from Alba Travel and use it for all your overseas trips - safer than cash and fewer charges than a traditional credit card. Anyone aged 18 or over can apply for an Escape Travel Card, load it with money before you travel and it can be used anywhere in the world – wherever MasterCard is accepted. It is safer than carrying cash and easier and more convenient than travellers' cheques. 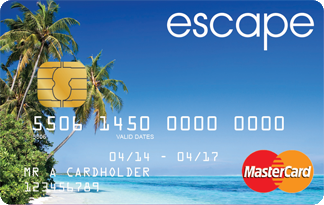 The Escape card has been tested by many of our staff in various worldwide destinations – as well as withdrawing cash from ATMs, the card can also be used in any shops, bars or restaurants that accept MasterCard. Once the application has been submitted and the minimum payment of £100 (maximum £5000) is received in our account by 15:30 (account details on application form), your Escape card will be sent to your home address on the same day. Photographic ID and proof of address may be required. If you prefer a personalised card with your name embossed on it, this will take 10 to 14 days to process.